You step into a light, white interior. A Perpendicular arch divides the tower from the nave. 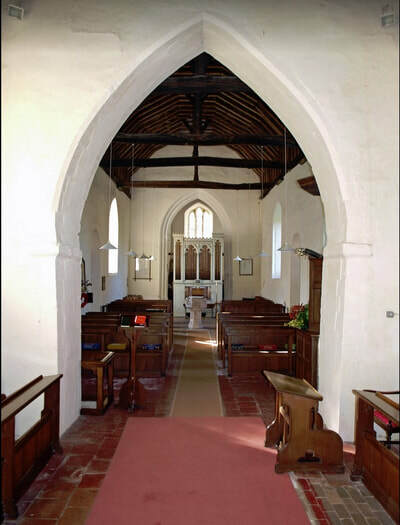 The chancel arch has a plain and pointed head, but its jambs are Norman and the later arch rests upon Norman imposts. The nave is fitted with simple but very tasteful modem benches. The floor has been cut away to reveal the stonework at the base of the arch. A whimsical 1950s window on the south side includes thatched cottages and what looks like a castle behind a nativity scene. 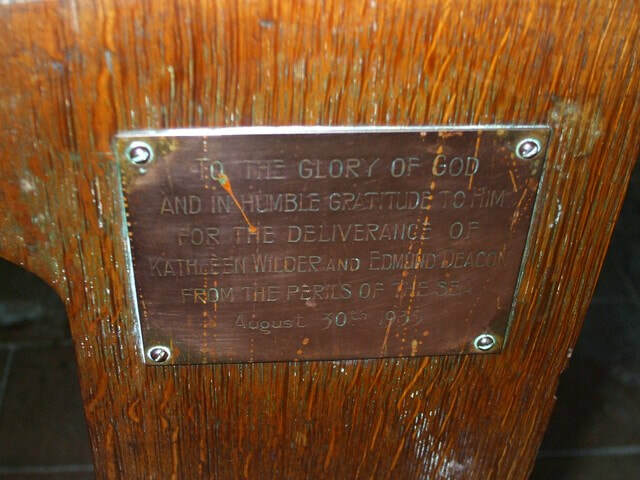 In the north east comer is the fine 18th Century pulpit, which is complete with back and sounding board. This was until recently a two-decker pulpit, but its lower stall has now been removed. 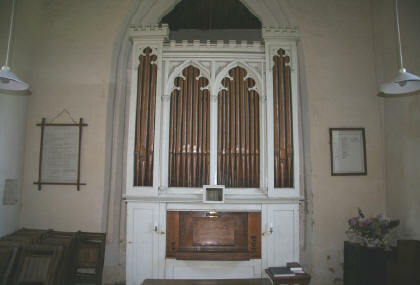 The church has a small, but beautifully toned organ. 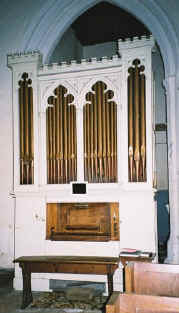 This instrument is of considerable age for a village church organ and was built by Gray of London in about 1820 (according to the church finance record). It has five speaking stops. In the north wall of the tower is a fireplace. The outlet for the smoke can be seen in the exterior wall, some 16 feet up and covered with a stone baffle. 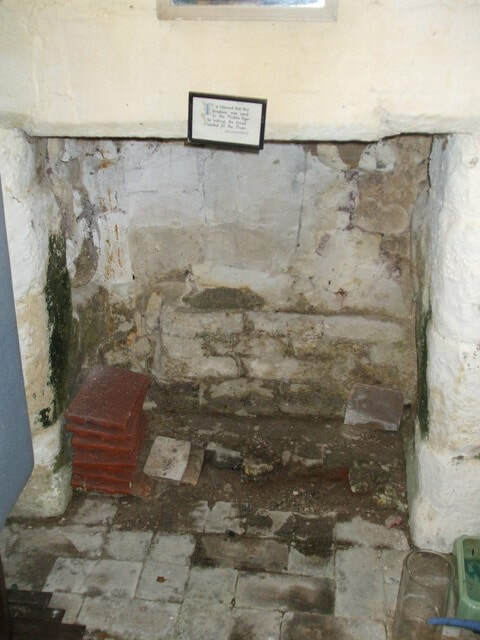 The church guide suggests that it might once have been used for baking the bread used at the Mass, although there could be other reasons why you might have a fireplace beneath a tower, especially if it had been used as a vestry during the 17th and 18th centuries. 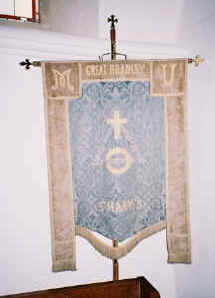 However, it does appear to be part of the original fabric of the tower. 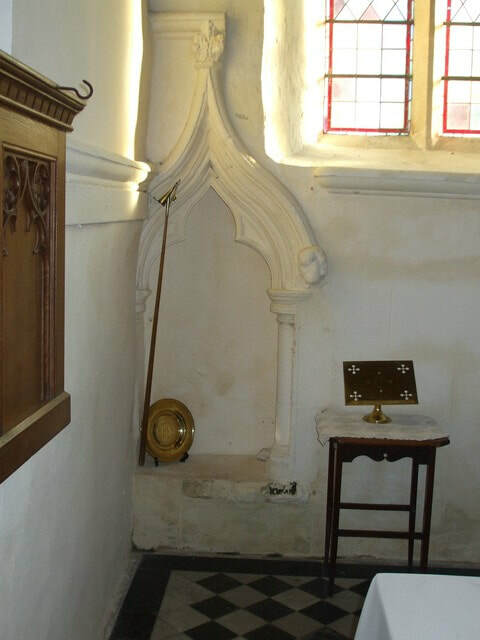 Up in the sanctuary, at the eastern end of the south wall there is another curiosity, a very fine 14th century sedele, which has a trefoil-headed ogee arch, resting upon semi-circular pillasters with moulded capitals and bases. Above it is a hood mould, which terminates in a foliated finial and rests upon one remaining corbel head. 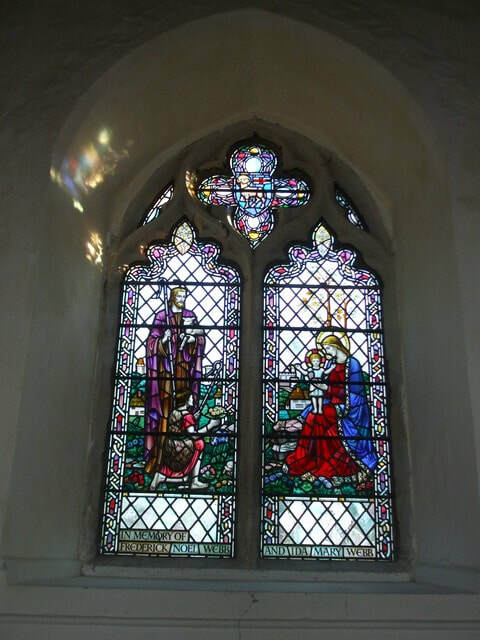 When the chancel reached to its full length there may have been more sedila and piscinae in this wall. 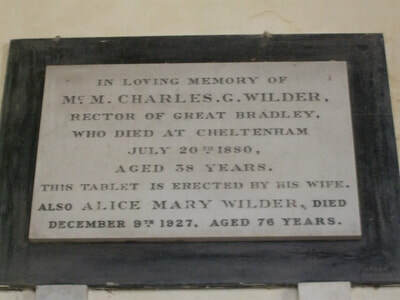 Parts of the string course around the chancel wall are probably mediaeval. 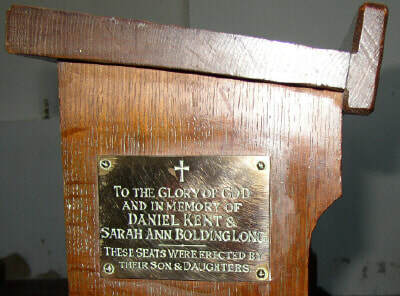 Hard up against the east wall is part of an exquisite sedila, just one of the three seats that once were used by Priest, Deacon and Subdeacon in a High Mass. The thing that makes it so unusual is that the surviving sedile is the subdeacon's - that is to say, the most westerly. 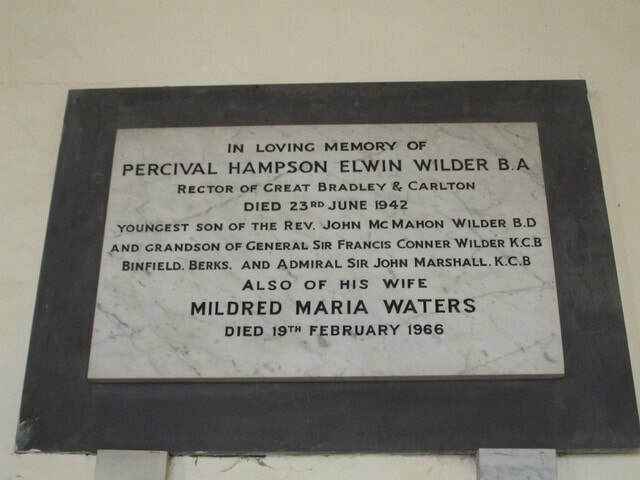 Clearly, at some point the chancel has been truncated, and the two upper seats and picina have been lost. 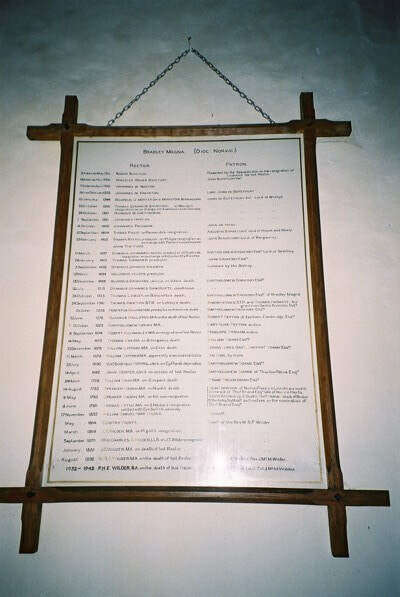 The Roll of Honour, commemorating all those who died in the First World War is a framed scroll on the south wall just inside the door. 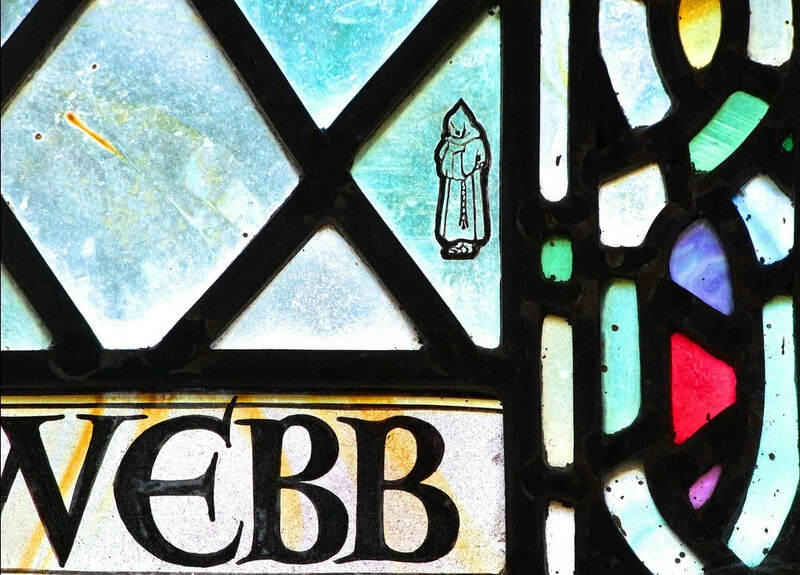 On the south side the only decorated window is dedicated to Frederick Webb and his wife Ida. On the south wall of the chancel is a wall monument, commemorating the Rev'd William Nash and his wife. 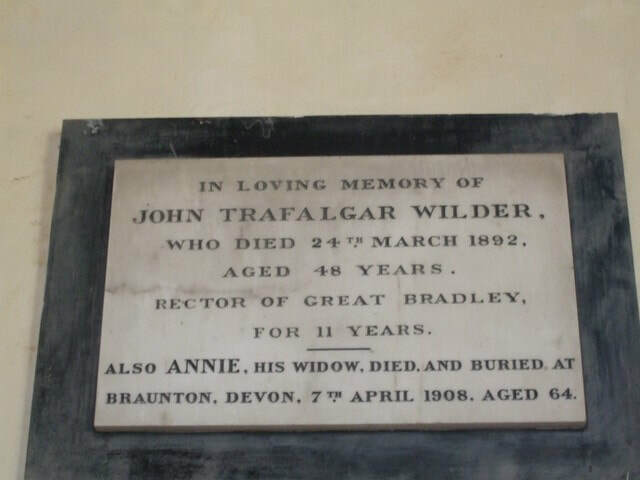 He was Rector here and died in 1783. 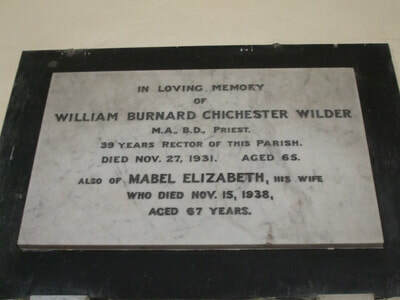 Other wall plaques can be seen on the north wall of the chancel, commemorating four brothers - Charles, John, Bumard and Percival Wilder, who were all in turn Rectors of the parish, and held this living for a total of 74 successive years. 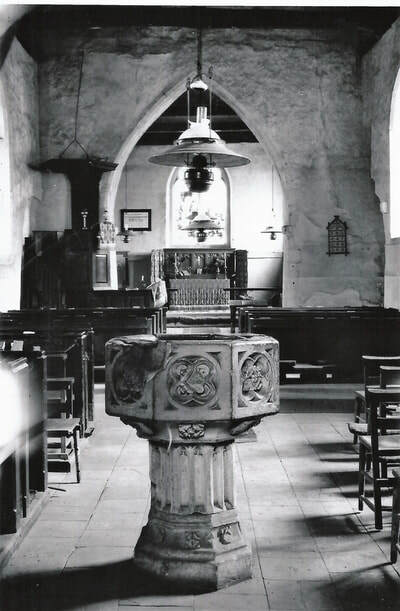 The octagonal stone font dates from the late 14th century. In the panels of the bowl are quatrefoils, containing fleurons. More fleurons and some shields are carved beneath the bowl. Around the stem are trefoil-headed arches and around its base are more fleurons. 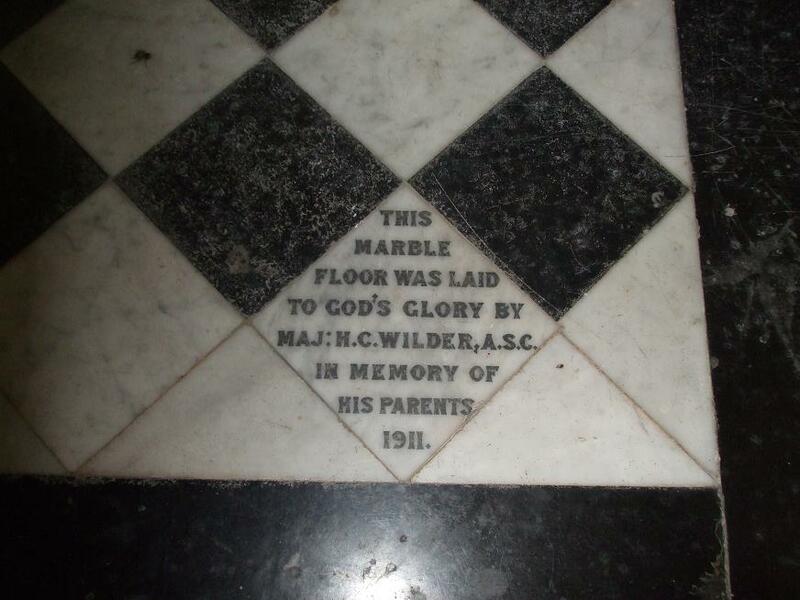 A careful look at this font reveals traces of original colour in the stonework. 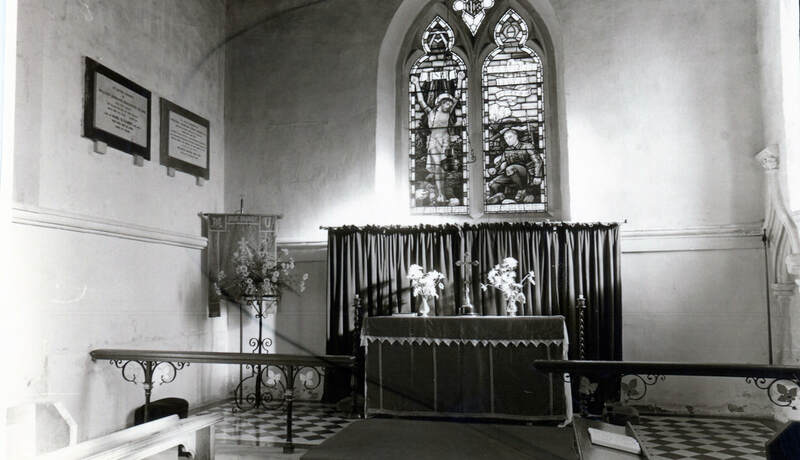 Amongst the church plate is a paten made in 1684 and two cups, dating from 1743 and 1809. 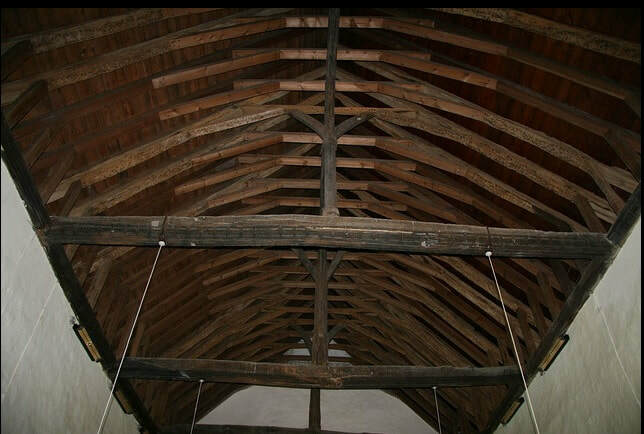 Near the west end of the nave, in the south wall, is a deep recess which may have been used as a cupboard in mediaeval times. 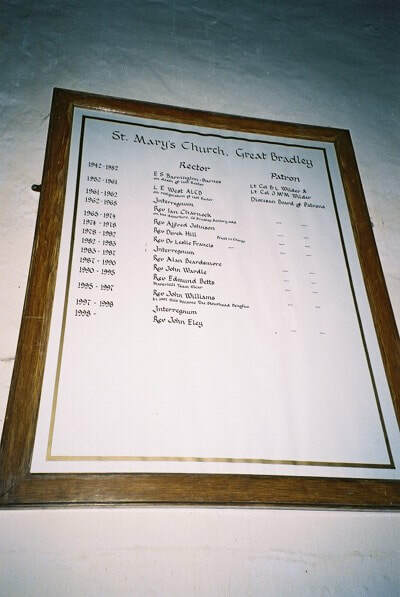 On the west wall is a list of rectors of the church from the year 1311. Select from the menu to see the full list of records. 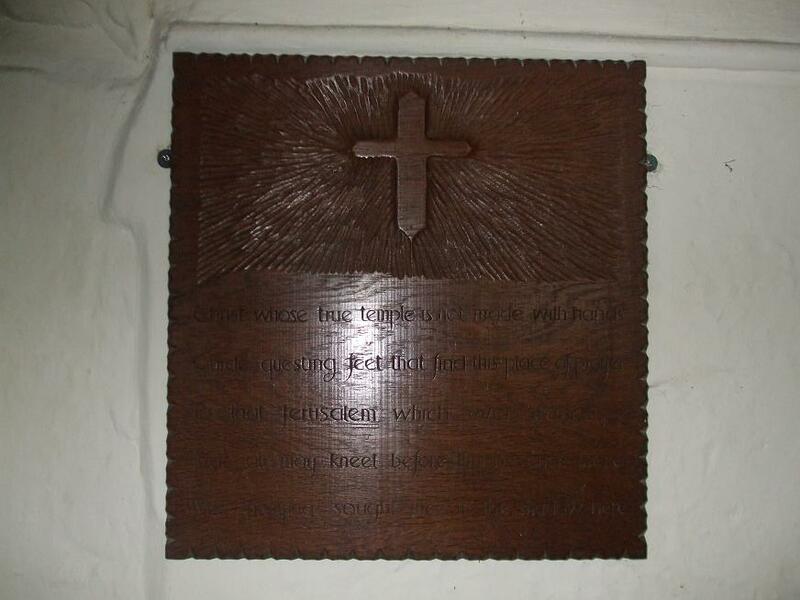 By the rood screen is a lowered part of the floor showing a lower part of the floor and wall. 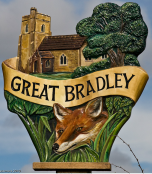 It is not known what part of the former buildings this is part of.